I need an experienced OpenCart developer to convert an simple OpenCart 2 ocmod file into a OpenCart 1.5.6.4 compatible vqmod. I am currently running Maria DB 10.0.30 without problems on OC 2302 if that helps. If a developer has badly developed their plugin/extension (only optimized for MySQL) could MariaDB have a negative impact on this? 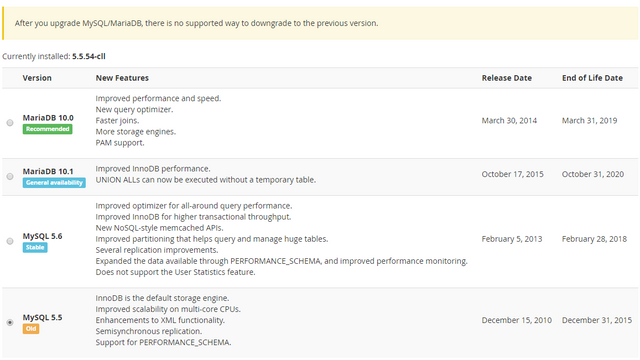 Any risks or compatibility issues of me going from MySQL 5.5 to MariaDB 10.1? There are also many others on the OC Marketplace. It's true, OpenCart used to be a standard integration for many 3rd parties but now they don't bother with it. Shopify, BigCommerce & Magento have taken over the world. Would love to see a dev create this extension! Would happily pay a nice premium for it! This is something I am sure a lot of people would purchase! Why does SagePay Direct have Cron Job? Did you ever figure out how do this? Our accountants have asked us for stock listing as at 30 November 2015 showing the value of stock held at that date. I don't think there will be a way do this, as OpenCart does not log historical stock levels.